Our next Xbox Live Co-Op night approaches, and once again we're calling upon Xbox Live members to defend ourselves from the undead. We'll be playing Left 4 Dead 2 and we want you to join us! With new guns, melee weapons, survivors, zombies, special infected, and five scenarios campaigns there's going to be a lot of zombie killing going on. The slaughter begins on Thursday, December 17th at 8PM EST. Look for the following staff gamertags to play, or leave your gamertag below to meet up with other folks. We'll be playing any of the campaigns in co-op for as long as humanly possible. 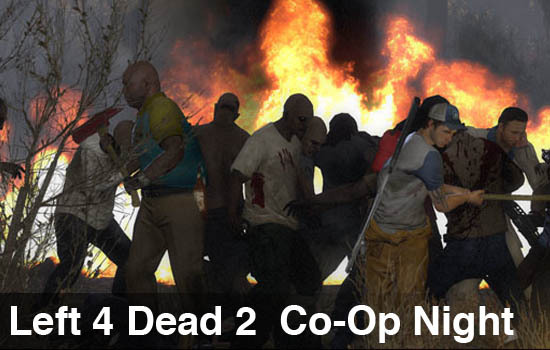 Don't forget to check out our review of Left 4 Dead 2 as well, perhaps we'll get lucky and see a title update as well! We look forward to seeing you this Thursday!